Hello, Hola, Pagbati everyone. I am Fr. Mike Bucciarelli newly appointed pastor of Our Lady of the Mountains Parish. It seems like I have come full circle since I was ordained a priest in 1975 in the Post Chapel at Ft. Huachuca. I grew up in a military family and entered Regina Cleri Seminary (high school) in Tucson in 1963. (Regina Cleri is now St. Augustine High School.) After ordination I have served in parishes in Tucson, Mammoth, San Manuel, and for the last 10 years have been pastor of Our Lady of Lourdes Parish in Benson. I have also served as co-Vocation Director; advocate, judge and defender of the bond on the Marriage Tribunal; Board of Consultors, television station; Diocesan Pastoral Council; RCIA board; and I am currently Vicar of Cochise Vicariate. I am delighted to be back in Sierra Vista as I feel like I have come home again. I am looking forward to serving the community here at Our Lady of the Mountains as I follow in the footsteps of my friends, Fr. 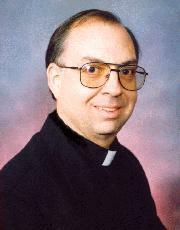 Bob Bryerton, Fr. Bob Brazaskas and Fr. Ariel Lustan. Since they have done so much to serve and build this beautiful community, I know that I have big shoes to fill and that humbles me. On the other hand, I am excited to be working with All Saints School. After 39 years of priesthood, this will be my first experience working with a school and I hope and pray for your support, help and prayers as I begin my ministry at Our Lady of the Mountains and All Saints School.